I am a copy editor for a Fortune 100 company by day, a copy editor by night for a small press, and a writer. As such, I am extremely rigid and unforgiving when I am asked to review and analyze a book about grammar and syntax. 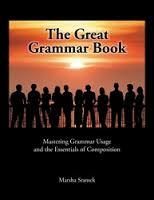 I am happy to say The Great Grammar Book (Second Edition) by Marsha Sramek exceeded my expectations. The book uses familiar and easily understood language to go over the fine details of the English language, patiently walking the reader through each step, starting with parts of speech and ending with a comprehensive chapter on successful writing techniques. The example sentences used to demonstrate the nuances of the lesson being taught were full of interesting trivia, making this not only an informative review but also an interesting read. My favorite things in this book were the pointers regarding commonly misused words. (Chapter Two, for example, patiently explained that “alright” does not exist in standard English—a pet peeve of mine when it crops up.) There were numerous examples highlighting common errors, all of which made me start mentally composing a list of people who would benefit from this book. Suffice to say, most of my holiday shopping is now done. The only proofing error I found was in Chapter Five, “Using Apostrophes Correctly.” Chicago Manual of Style, 6.114 notes that the using the left single quotation mark “should always be construed as an error.” Basically, the tail of the apostrophe should always point to the omitted text, which didn’t happen in the section on omitted numbers (Spirit of ’76 was displayed as ‘76, for example). This is, of course, a minor error, but one I’m sure the author is chastising herself over as I type this. The Great Grammar Book is fabulous for writers, editors just starting out (I found it to be overly simple for my editing level, but it never hurts to review the basics) and anyone who misuses the English language on a daily basis. I’ve brought it in to work with me to use as a reference when I’m tired and second-guessing myself. This book should be mandatory for every writer’s library. The Great Grammar Book is available on Amazon here.